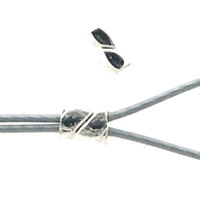 Our most popular crimp is now available in the same 99.9% Pure Silver Ultraplate® as the Snapeez® rings, and now in a size to accomodate wire up to .024!!! No special crimp tool needed.. just use your tapered end chain nose pliers! They have designed the crimp to be very snug, so be advised to cut the beading wire on an angle before trying to push the wire through. I love the look of these - they give a very secure crimp, and a very nice look compared to standard crimps.